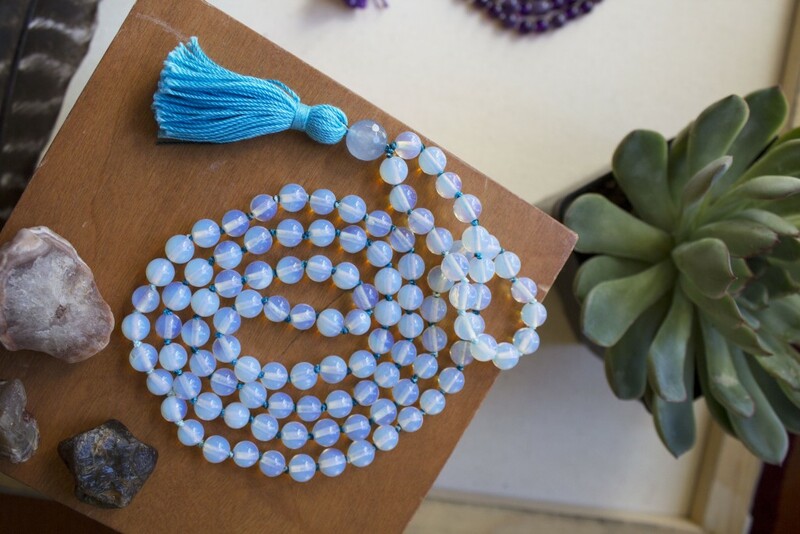 It’s easy to see why mala beads are so loved. They are beautiful-looking, meaningful, and act as a meditation or prayer tool. Thinking about getting one of your own? 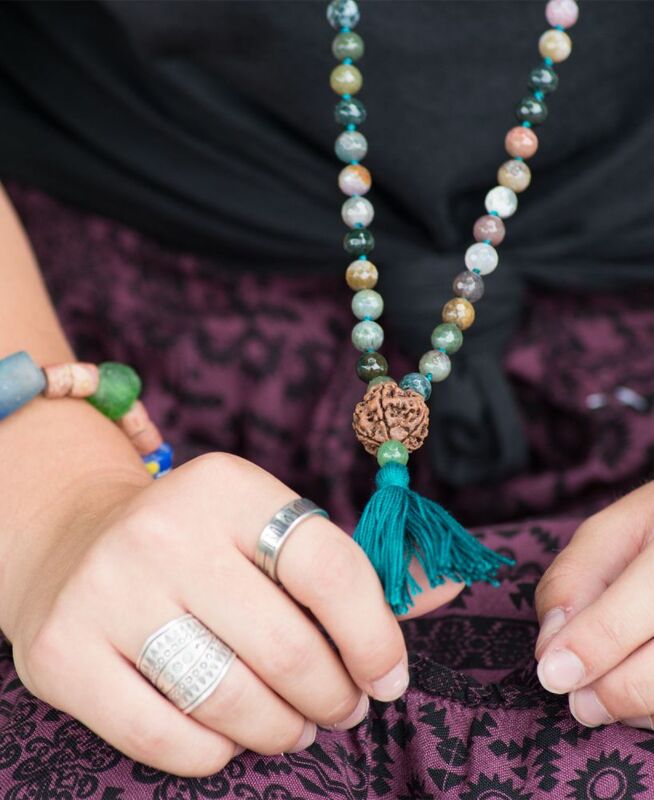 Read on to learn the how-to’s of choosing mala beads that are best for what you need. 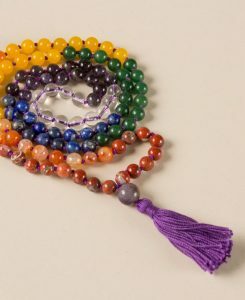 Mala beads (also known as Buddhist prayer beads) were traditionally used as a tool to count the number of times a mantra is repeated, breaths taken while meditating, or the amount of prostrations. In Tibetan Buddhism, common numbers of beads are 21, 28, or 108. 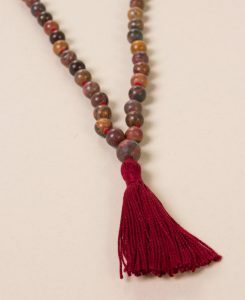 A typical modern mala “necklace” has 108 beads today. (Source) The number 108 carry a lot of significance, not just in Buddhism and Hiduism, but also in astronomy, mathmatics, and sacred geometry! 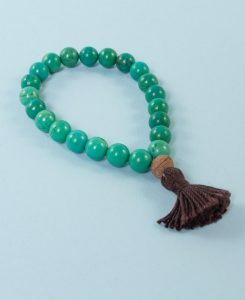 When applied to mala beads, the 108 represents the number of repetitions you focus on while using the beads. So how do you go about choosing mala beads? Choosing Mala Beads: What Size is Best for Me? 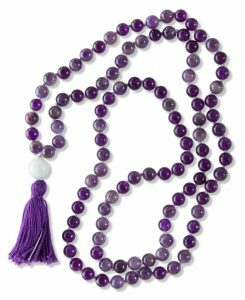 Also, when choosing mala beads, you have the option to choose a mala bead necklace (with 108 beads plus a guru bead – an often larger bead that represents the start and end point of the prayer beads). Or you can choose a mala bead bracelet, with 24 beads plus a guru, grounding bead. 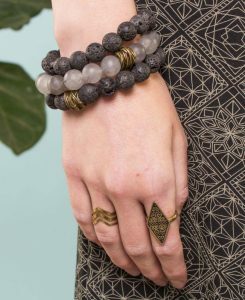 A necklace is the more traditional choice, but a bracelet gives you a smaller option and can also be used for a simplier, faster meditation while on your wrist. Choosing Mala Beads: What Energy is Best for Me? 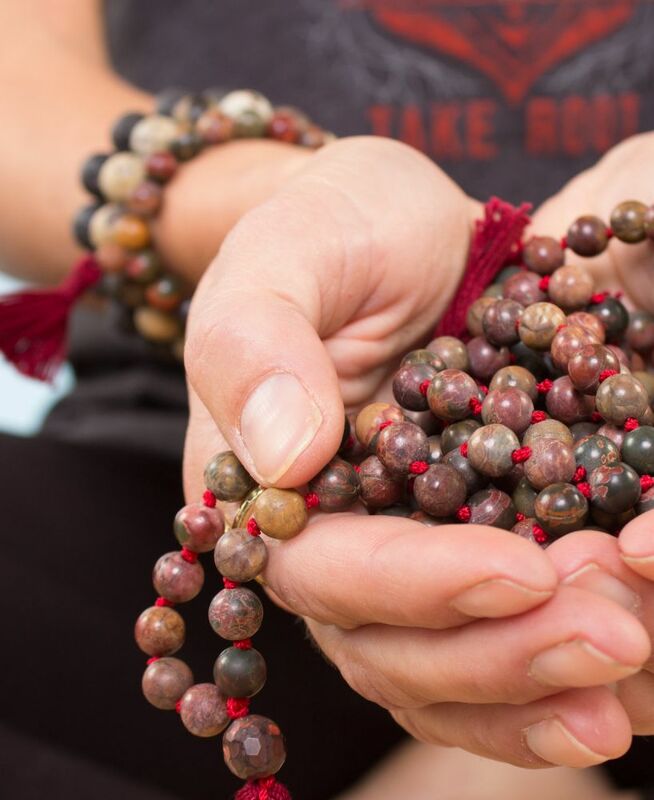 The best way to go about choosing mala beads is to think about what kind of energies you want to support and nurture in your meditation or prayer practice. 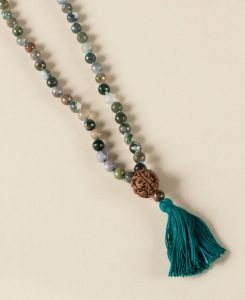 Each type of semi precious stone or gem in a mala strand is associated with specific properties that, when combined with a powerful mantra or deep breath, have the ability to completely transform your practice. Turquoise– Supports a constant steady flow of healing energy. Moss Agate – Grounds you, corrects left-right brain imbalances and stimulates creativity. 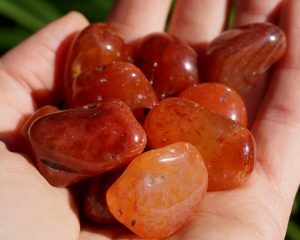 Carnelian: Known as the stone of motivation, endurance, leadership, and courage. Quartz: Called the “universal crystal” because of its many uses. Absorbs, stores, amplifies, and transmits energies. 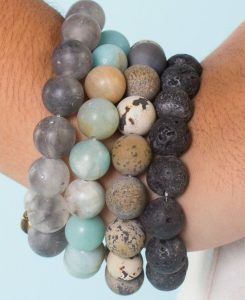 Lava Stone: Stabilizes the root chakra, calms emotions, intense healing powers. Jasper: Supports a sense of tranquility, wholeness, and grounding. Amethyst– Possess strong healing and cleansing powers known to ease headaches and release physical tension. Multiple Stones: Brings balance to your life, allowing you to open up to the abundance that surrounds you. Chakra Stones: Restore your energy through the power of the seven chakras: Root, Sacral, Solar, Heart, Throat, Third Eye, and Crown. 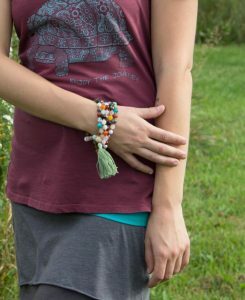 Traditionally, malas are held in your right hand in one of two ways; between the thumb and ring finger, or resting on the middle finger, using your thumb to rotate through each bead. You begin at the guru bead (the one that usually has a tassel attached or is bigger or a different stone) and continue through each bead, until you reach the guru bead, then turn the strand around and go the opposite direction. Choosing a mantra is something personal and may take some time, but here are some great options to think about. 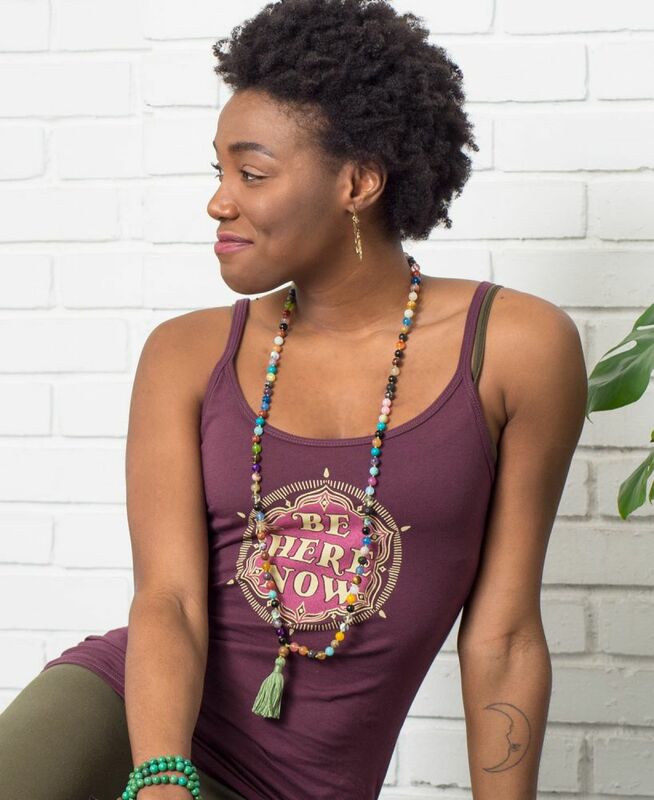 Choosing Mala Beads: Can I Wear It? 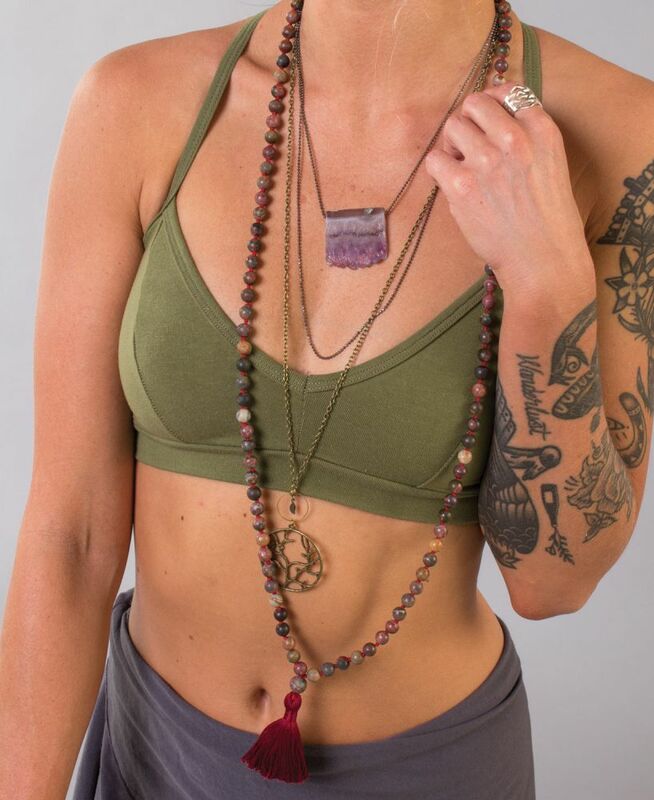 Depending on how long your mala is, it can be worn around your neck, looped multiple times around your wrist, or, with a mala bracelet, just worn as a single strand on your wrist. Take note to remove your malas before bathing or going to bed and to keep them in a space with positive energies to preserve all of the good mantras and kind thoughts you’ve put into them! « Are you a Moth or a Butterfly?